Old Orchard Beach is considering putting a temporary ban on food trucks, such as this one seen in this one in Portland in 2014. 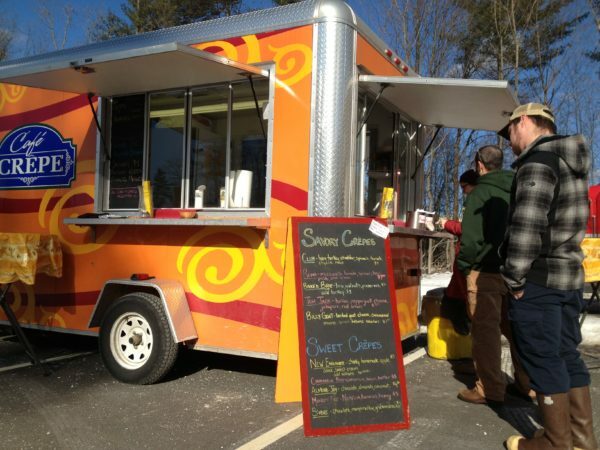 At the town council’s July 18 meeting, local businesswoman Lisa Gribbin went before the Town Council representing two food trucks that were seeking business licenses to operate on her property. The Town Council denied the business licenses, stating the town’s ordinance did not allow them. Gribbin said she had read the town ordinance and believed food trucks were allowed, and went to the planning and code enforcement offices and was not told otherwise. Town Councilor Shawn O’Neill said he was saddened the ordinance was unclear and misinterpreted and he apologized that she had gotten so far along in the licensing process. Town Manager Larry Mead said the businesses would be reimbursed for money paid to the town in pursuit of business licenses to operate the food trucks. According to town council commentary, it is clear the Town Council does not want food trucks downtown, and it does not consider food trucks to be food stands. A moratorium, which would temporarily ban mobile food businesses, would give town officials time to proposed permanent ordinance changes that would clarify the town ordinance so there isn’t any confusion in the future, according to town commentary. According to Town Council commentary, town planner Jeffrey Hinderliter has suggested the town consider creating identifying food trucks as a specific land use and coming up with a definition for food trucks, adjusting the definition of food stands so that food trucks are excluded, and considering rules for food trucks at special events.